Integrity starts with craftsmanship. Every product we make is designed in-house, and built-to-order. Your hardware is CNC plasma cut to precise tolerances, then hand-assembled by our team of engineers to build you the strongest, toughest accessories in the industry. Every component we design is tailored to your vehicle for a seamless factory look and OEM fit. 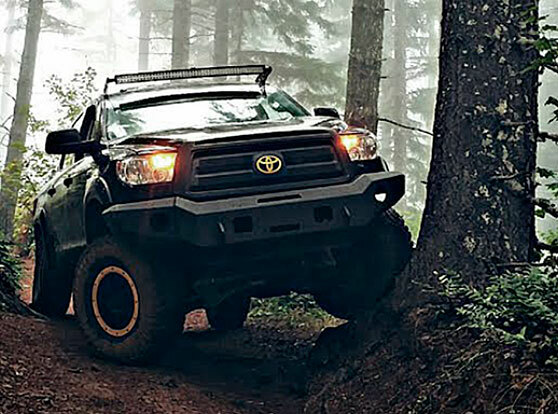 Choose from hard-working winch-ready bumpers with a variety of options, or low-profile beauty bumpers that are just as tough and add a unique look to your truck. Further customize your rig with your choice of brush guards, lighting, and color-matched powder coat finishes. Our bumpers and headache racks are built to withstand the toughest abuse you can dish out. All of our products are built using 3/8" American steel, computer-modeled to ensure their structure is both strong and lightweight, and welded on both sides of every seam for maximum strength. Our bumpers are made specifically for heavy duty applications to handle anything you throw at them. Protect your truck and enhance its look with our heavy duty winch-ready or low profile beauty bumpers. Our headache racks are made of heavy duty steel to protect your truck without sacrificing style. Customize your rack with mounting for lights, rear-facing winches, or locking slide-out toolboxes.